Each hotel unit, camp, hospital or even municipality has special features that differentiate it from one another. Therefore, the solutions proposed in each case are customized according to the specific characteristics. The evaluation of the corresponding waste management system and their techno-economic management planning that responds to the specific characteristics of each business are crucial to the selection of sustainable solutions. Green waste generated by the maintenance of green areas (cutting turf, pruning and cleaning of green spaces, deforestations). Food waste produced from restaurants, kitchens, and breakfast buffet, which is the most important type of waste, due to the unpleasant odors it can produce especially during the summer months. The glass bottles, although they do not produce unpleasant odors, they occupy a significant space that is mainly 90% air. Other recyclable materials still pose problems mainly due to the volume they occupy. It’s high time waste management became a priority for all, since it is possible to reuse materials and reduce the carbon footprint. In addition, article 42 of Law 4042/2012 (Government Gazette 24 / Α / 13-02-2012), as amended by article 157 par. 1 of Law 4389/2016 (Government Gazette 94 / A / 27-05 -2016), a Digital Waste Registry (DWR) was established, with the obligation to register waste producers. Each hotel facility is required to register with DWR and apply systematic collection and processing of waste production and management data. In addition, it is required to submit an annual computational report which is completed at any time within the specified time by the administrator, but in any case, before the deadline set by the legislation for its submission. After this date, the system does not accept any further modification of the Waste Report, which is automatically submitted by the deadline set on March 31 of each year. Based on the above and having experience in implementing integrated waste management programs in enterprises and municipalities, a series of proposed solutions of general interest are developed. In order to determine the proper management solutions for the above-mentioned streams before all, it is necessary for the company or municipality to know what it produces and then to select, on techno-economical terms, the waste management actions appropriate for these particular characteristics. a techno-economic assessment identifying sustainable actions and necessary waste management equipment. The ideal way to handle all organic waste is composting. The compost produced is a soil improver for all green areas, but mainly for the organic vegetable garden, where materials used in the kitchen are produced. When adding compost in the soil, the most important is that it increases the organic substance (the Greek soils are very poor in organic matter) and beneficial microbial populations. These microbial populations are the ones that break down complex compounds into simple ones so they can be absorbed by the root system of plants. The need for fertilizing is reduced and the land is being promoted by chemical fertilizers. Finally, compost’s contribution to water retention is significant due to its high water capacity. 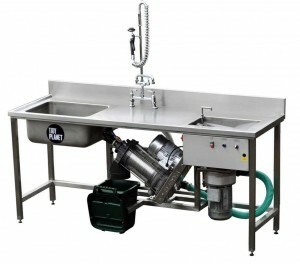 The first step for the proper management of organic kitchen and restaurant waste is sorting at source. In practice it is necessary to use separate bins for the collection of organic waste at each production site. The use of a DEHYDRA Dewatering Unit is then ideal to reduce the volume and weight of the waste. The dewatering station consists of a powerful waste bin which pulps all food waste and then through a pump, promotes the pulp in centrifugal dehydration achieving 80% volume reduction and 50% weight reduction. The final product produced is of small particle size and is an ideal material for composting in an accelerated composting plant. Reducing the final volume and weight drastically reduces staff’s workload to remove waste. The collection can be made in 120-liter roller bins, which in turn will be forwarded to the composting plant. The collection of pruning and green waste will be made easier and faster with the use of a special chipper. 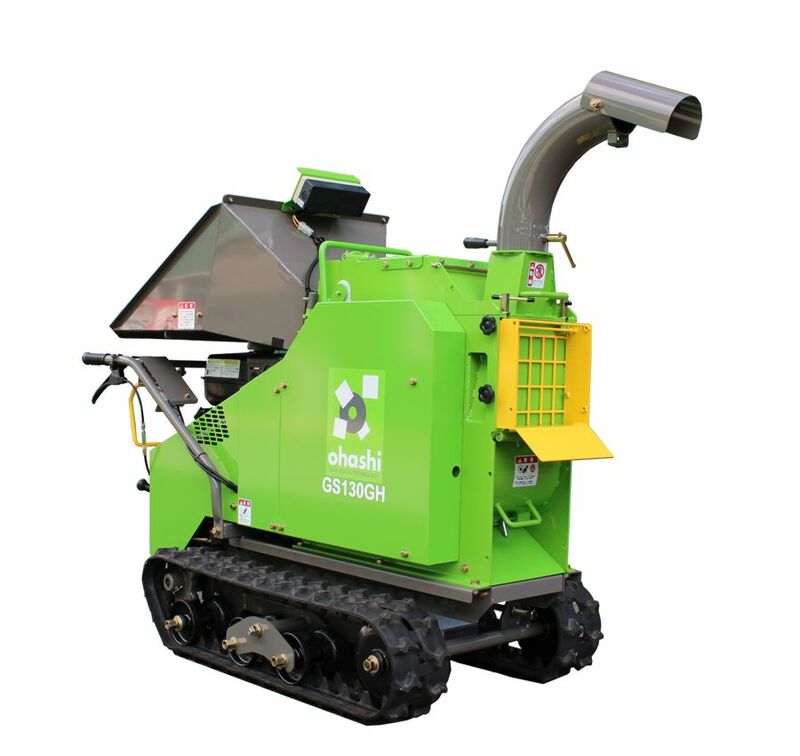 OHASHI chipper made in Japan is self-propelled with rubber tracks, allowing it to move on all surfaces. The reduction in the volume of green waste can reach 80%, resulting in a reduction in the number of maintenance staff. The produced material is ready for addition to a composting plant along with food waste. Reducing time and service hours for green maintenance staff. Reducing use of plastic bags for green waste disposal. Selection of final product size and capability of production of decorative wood chip. 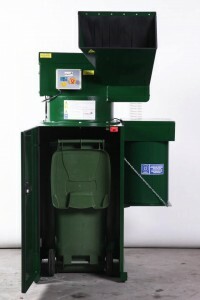 Can be collected in 120-liter bins and loaded automatically into the composting unit. The ROCKET can produce immature compost in just 14 days from the day of loading. Immature compost needs another two weeks of maturing outside without any other process. As mentioned above, it can compost all organic waste produced from kitchens, restaurants, and mainly from gardens, as well as animal droppings. Process with a very low operating cost as it requires just 30 Kwh per week. Easy process with monitoring system from 4-channel temperature recorder. Ability to retrieve graphs via computer and adjust composting parameters. Wireless monitoring capability to ensure easy access. As mentioned above, the glass bottles occupy a large volume and their collection in the central bins requires additional staffing. The proposed solution is the innovative fragmented glass bottle machine PEL. The first stage concerns the placement of the small silent BB01 in bars, where the main production of glass bottles is present. Very small in size, it can be placed even under the bar. With 65 db when operating it ensures minimum disturbance. The crate is filled with about 90 bottles, reducing the volume by 80%. This process reduces the mobility of the staff to dispose the empty bottles to minimum. 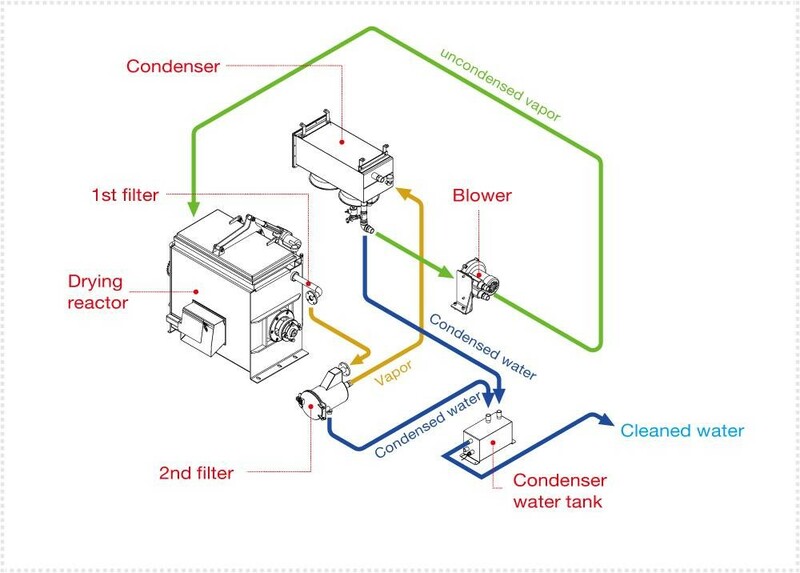 In the second stage, BB06 can be placed in the waste facility, which can break 4000 bottles approximately per hour. A wheeled bin is used to collect the fragments and fills with 680 bottles. This way the volume reduction is about 80% and the fragments can be recycled. To the category of the remaining recyclable materials appertain all cartons, paperboards, packaging materials, crates and plastics. The ideal management for the materials above is the vertical press process with PEL , by which the reduction of volume achieved can reach 60% to 80%, producing uncluttered bundles of sorted materials. By this process the appearance of the waste products site is improved, which gives added value since the sorting of materials is considered to be one of the basic environmental principles implemented in the EU. 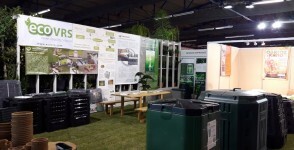 The production of non-suitable for composting and recycling waste is inevitable. In this case the use of large bins is recommended. 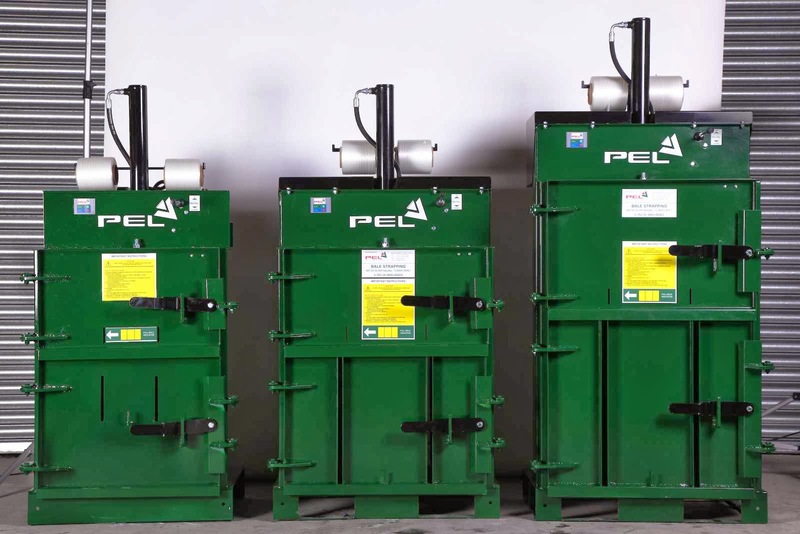 The decrease of the bins required due to the conditions above could be achieved with the use of a press regarding the 4-wheeled bins, thus minimizing the volume up to 66% and technically decreasing the necessary bins up to 1/3. The ideal technique of managing all organic waste is composting. In this case there is a concern not only for the available space but also for the final disposal and use of the produced compost. The alternative recommended that solves all the mentioned problems is the drying technology with GAIA machine originating from South Korea. 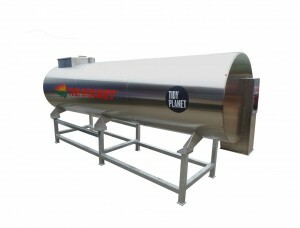 The drying technique is mainly based on the fact that food waste and kitchen waste are primarily consisted of water up to 90%. Water is the most basic component that creates the ideal environment for microorganisms to decompose that bio-waste, hence creating unpleasant odors. Thus by removing it with the drying technique these odors are eliminated. 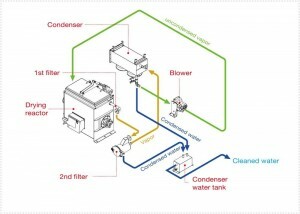 A diagram explaining the closed loop technology of particular dehydrator models is displayed above. In the process of dehydration through heat, the contained food water is being removed via steam. Once the steam comes through both filters, it liquidizes and is being removed through the sewage disposal. This way the bio-waste is being circulated in a closed network, thereby avoiding emerging smells and emissions in the surrounding area. 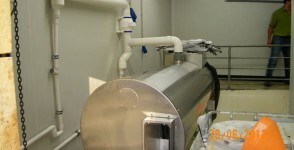 It is a clean process which takes about 9 hours to complete. The final product is a leveled powder with no smell, 80% to 90% lighter than the product before. It could be used as biomass or as organic additive in gardens. Use of the product in not mandatory and it can be easily disposed if not used. The benefits of dehydration remain even if the final product is not being used since less bins and less cleaning employees will be needed. Even in extreme cases where the municipality’ cleaning services fail to collect the waste (because of strike or else), there will be no problem with emerging smells or hygiene issues. 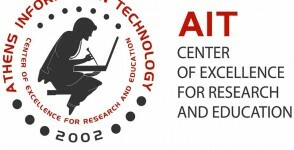 For your information there is a dehydration unit at the National Technical University of Athens open to the public, in which a pilot project regarding the management of bio-waste of 2 municipalities of Athens is being hosted. 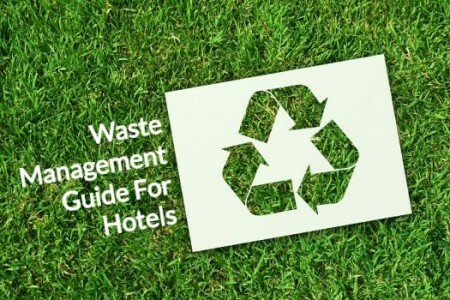 The available models hold different capacities from 20kg/day to 1200kg/day, so an accurate measurement of the daily bio-waste your hotel produces is of utmost importance for the selection of a suitable model. The process of incineration is the combustion of waste in temperatures up to 1200 Celsius. The remaining ashes are just 3% of the former mass. The incineration machines have a second combustion chamber as it is required from the EU guidelines for pollutant emissions. This method is ideal in order to accomplish the ZERO WASTE principal since all materials that don’t fall into the categories of recyclable and biodegradable waste can be incinerated. At the same time there is the possibility of retrieving energy by the form of hot water. They operate on gas or diesel at a very low and efficient consumption. Nowadays, there are all available technologies to achieve the Zero Waste goal, which is recognized worldwide as an objective for big businesses and especially governmental ones. All the above solutions offer added value to your product and to your customers. The profit from the garbage collection is notable, as well as the benefits mentioned from the use of compost. 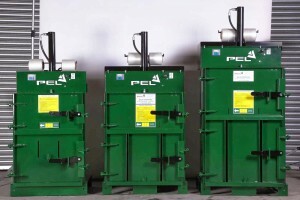 Considering the presented study and in case of interest, our next step would be to propose a financial offer for the most suitable recycling program and the machinery required to achieve your business goals. Therefore, it would be necessary to record the relative amounts of waste generated per day from each waste stream. If no relevant estimate is available, we can identify the amount of waste generated and come up with a plan that suits you. We are always at your disposal for a customized proposal or any clarification needed.